Naturally the disclaimers i already mentioned in my previous blog post will apply. Especially the circumstance that certain African countries tend to be overrepresented in Ancestry’s customer database (notably Nigeria and Ghana) while others (such as Angola and Benin) are underrepresented. The notes in the first column (“most likely background”) of the DNA matches screenshots are made by myself. When i did not have near certainty about the background of the matches i used a question mark (?). When i was able to verify a person’s background by way of their family tree or familyname i used an asterix (*). Despite having an impressive number of DNA matches this African American from Ohio most likely only has one African DNA match. Still it seems fitting that this one single match should be from Nigeria as this person has one of the highest “Nigeria” amounts i have seen for African Americans. In fact many Nigerians themselves do not even score over 50% for “Nigeria”. Given her deeply rooted Midwest family origins it seems likely to assume that on her African side she is ultimately tied to Virginia and its slave trade patterns which were heavily involving the Bight of Biafra (southeast Nigeria). This single Nigerian match could prove to be valuable in providing more clues about the ethnic specifics of the 56% Nigeria amount. But it is well advised to keep in mind that this person probably has at least dozens of individual Nigerian ancestors who were relocated to the US. Each single ancestor to be traced back mainly to the 1700’s. Implying that their individual genetical contribution might even be less than 1%, depending on recombination (see this useful table). Many of them might have belonged to the same ethnic group, Igbo origins seem very likely indeed. But not all of them would have been. So it’s prudent to remain openminded about other ethnic possibilities (such as Ijaw, Efik etc.). The other 6 matches with only African regions in their profile are most likely either African American or West Indian. I did also come across another DNA match who is half Liberian and probably half African American. Unfortunately in that case the mixed background of the match complicates establishing a plausible connection. But possibly it is associated with this person’s 6% socalled “Ivory Coast/Ghana” score. This second African American woman (multigenerational US-born on all lines atleast till the 1840’s) seems to have hit the jackpot when it comes to her number of African DNA matches! I chose this particular profile not because of any regional predominance but rather because this African American is herself 100% African genetically speaking. As can be seen in the first screenshot her breakdown within Africa is actually very balanced between her top 4 main regions. Sofar it seems her Nigerian and Ghanaian lineage is already reflected well enough in her DNA matches. 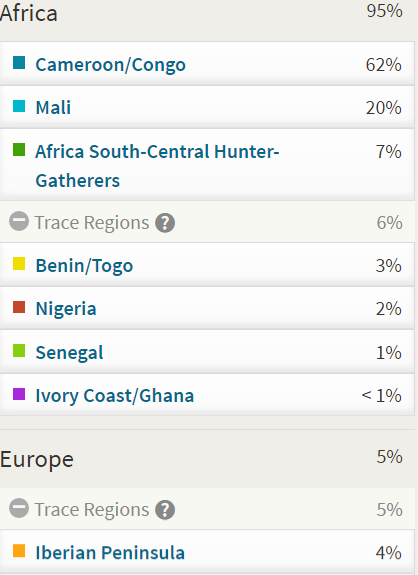 And even the 6% “Senegal” merely reported as trace region is being confirmed (the match being a Wolof). However not so her possibly Central African origins (“Cameroon/Congo”) and also any Gbe matches (“Benin/Togo”) are lacking sofar. 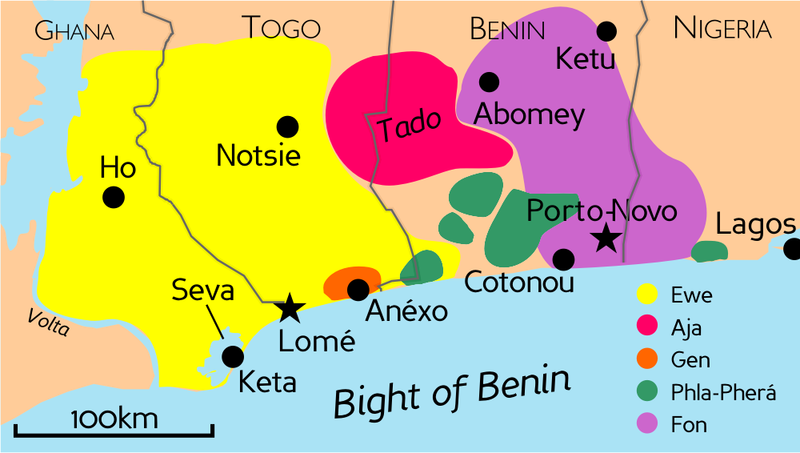 Although actually the “Benin/Togo” region might also be linked to southern Nigerians. Not surprisingly perhaps it turns out that many of her DNA matches are likewise 100% African, no less than 166 persons! The overwhelming majority being African Americans (24 confirmed by family tree) and also West Indians. Dispelling the myth that somehow African Americans with 100% African DNA would be non-existent! But also making it more difficult to single out the 11 most likely native African matches. I do have to make a critical side note though: i highly suspect that atleast a few of these profiles being reported as 100% African are actually due to either incomplete or erroneous reporting by Ancestry1. Compared with the previous African American results the contrast appears to be huge. Only seven 100% African DNA matches were reported for the African American from Ohio. Despite having almost three times more DNA matches (6,226 vs. 2,177). And just one of these matches happened to be a confirmed Nigerian versus most likely seven Nigerians for the African American from Georgia, despite a more impressive Nigeria amount (56% vs. 23%). Eventhough these are only two examples this outcome perhaps already demonstrates how your own family background influences how many 100% African DNA matches you might expect. Aside from non-African admixture and state origins of your family the age factor most likely also is of great importance as the African American from Ohio is only in her twenties while the second African American was born in 1910! Therefore skipping a few generations when tracing back to her African MRCA’s! I suppose it really boils down to how far you yourself are generationally removed from your African-born ancestors. On average of course, as afterall African Americans as well as most other Afro-Diasporans will have dozens if not hundreds of separate familylines connecting to Africa. For most African Americans the bulk of their African ancestry is to be traced to the 1700’s, while a lesser proportion will be traced back to the late 1600’s and also to the early 1800’s. Nonetheless it is known that for Georgia/South Carolina as well as Gulf States such as Florida a substantial number of Africans arrived even after Trans Atlantic Slave Trade was officialy abolished in 1807. While for Virginia (and by proxy also the Midwest/Ohio?) Trans Atlantic slave imports already ceased altogether by 1776 (see this overview taken from the Slave Voyages Database). Quite likely this difference in timing of ancestral arrivals explains a great deal of the contrast between these two African American profiles. Relatively more recent African origins are likely to increase the chances of receiving 100% African DNA matches (all other things being the same). This Brazilian profile shows a truly dominating socalled “Cameroon/Congo” amount in his African breakdown (59/76= 77%). This seems fitting enough given his southeastern Brazilian family origins. The slave trade imports to this area were mostly from Angola but also surrounding Central African countries (especially DRC Congo). This Central African share in local slave trade is estimated to have been around 80% of the total number! (see this overview taken from the Slave Voyages Database). Sofar however no Angolan matches have appeared yet, which is undoubtedly just a reflection of very few Angolans having taken the AncestryDNA test up till now. Intriguingly the one single African match for this Brazilian is someone who’s half South African (Zulu) and half Seychellois Creole. 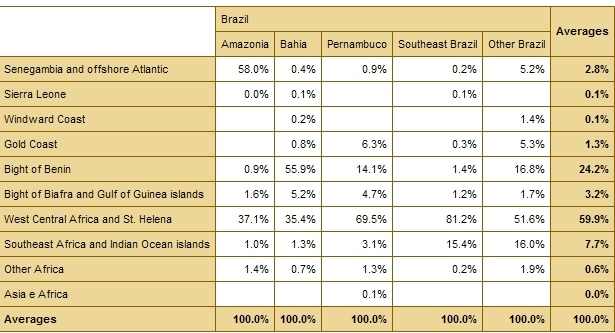 Even when these countries are rarely if ever mentioned as an ancestral place for Brazilians. Both countries are to be associated with the Indian Ocean Slave Trade. Especially the Seychelle side of this match could potentially imply many different ancestral connections. As this island group was a destination rather than a source of slave trade (similar to Mauritius and Reunion). Given the rather small segment size (6,8 cM) it might however be assumed that this match represents a socallled population match. Probably to be connected with a Mozambican MRCA (Most Recent Common Ancestror). This would historically make most sense as the Mozambican slave trade to especially southeastern Brazil was also significant (about 15%). Even so other ancestral scenarios stilll also remain a possibility. In addition this Brazilian also has a DNA match who is half Zimbabwean and half European. A similar explanation as above might very well apply, even when a ancestral connection through his European side (19%) should not be ruled out. In fact he also has probably two Cape Verdean DNA matches for whom a Portuguese MRCA is very much to be expected. Interestingly this Brazilian has told me he has rather recent ancestral ties (1800’s) with Africa along atleast one familyline, to be traced back to his gg grandparents. This is actually to be expected for many selfidentified black Brazilians as afterall Brazil still received African captives up till the late 1800’s in great numbers. Nonetheless his number of 100% African DNA matches (only two) seems very much subdued. Again most likely a reflection of Ancestry’s customer database sofar insufficiently including Africans with strong ancestral ties to Brazil. He does however also have an intriguing DNA match with an African American from South Carolina. Their MRCA could very well be Congolese or even Angolan, eventhough again the segment size is rather small (6,2 cM). This Cape Verdean profile belongs to one of my (many) Cape Verdean DNA cousins. Eventhough his ethnicity estimates look recognizably Cape Verdean, his breakdown still stood out in my Cape Verdean survey. Not only did he score one of the highest “Senegal” amounts (40%) but also his socalled “Southeastern Bantu” contribution (11%) is among the highest (even when he has no known relatives from either Angola or Mozambique!). Given the overwhelmingly Upper Guinean documented roots for Cape Verdeans as well as plain geographical logics the “Senegal” predominance is to be expected. And in fact in my survey “Senegal” appeared almost consistently as biggest African region (48/52). Just like for me a Gambian (verified) match is being reported among his DNA matches. Therefore this Senegambian connection makes perfect sense. Interestingly this time it seems to be a person of Fula background judging from the additional “Middle East” and “Africa North” amounts. The second match, most likely North African, is also plausible given early Cape Verdean slave trade along the Northwest African coast (Morocco & Mauritania) (1400’s/1500’s); the deportation of socalled Mourisco’s from Portugal/Spain (1500’s/1600’s); as well as the more recent (1800’s) migrations of Moroccan Jews to Cape Verde. Other Cape Verdean profiles I have seen sofar actually also often show North African matches. And i myself had an Algerian (4gp) match on 23andme. In contradiction with actual ancestral proportions it seems Cape Verdeans are sofar more likely to receive North African matches rather than (mainland) West African matches. This possibly harks back to not only the current limitations of Ancestry’s customer database (which contains relatively very few Upper Guineans, especially from Guiné Bissau). But also it might indicate that the current threshold of DNA matching is simply too high for Cape Verdeans who will trace the bulk of their mainland West African ancestors to the 1500’s and 1600’s rather than the 1700’s or 1800’s. Which due to dilution implies smaller shared DNA segments. It seems telling in this respect that this Cape Verdean profile was the only one in my overview without any 100% African DNA match (genetically speaking). The reporting of a most likely North African match could very well be connected with the 3% socalled “Africa North” or the 1% “Middle East” showing up as a minor part in the Cape Verdean’s breakdown. There is however a great deal of genetic overlap between North Africa and the Iberian Peninsula. Which greatly complicates establishing the exact direction of the geneflow and also its approximate timing. You will notice that the North African match in fact also has an Iberian Peninsula amount (above low confidence level) while practically all Portuguese i have seen on AncestryDNA receive socalled “North African” amounts of inbetween 5-10% (see this sheet for an overview). Despite this Cape Verdean’s notable “Southeastern Bantu” score he does not show any matches yet from either Central or Southern Africa. The socalled “Southeastern Bantu” scores as reported for Cape Verdeans are fascinating eventhough also somewhat puzzling and ambigious. It was one of my most surprising survey findings. 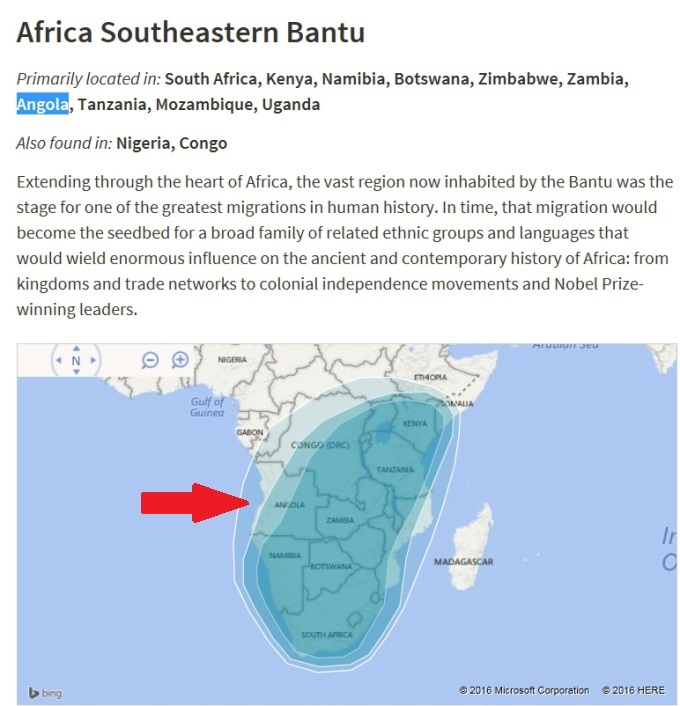 Assuming atleast the above trace level amounts are genuine i would say ancestral connections with Angola and Mozambique would be most plausible (although other ancestral options remain possible too). As already mentioned for the Brazilian profile AncestryDNA’s customer database in most cases will not yet be helpful in finding any DNA matches from either Angola or Mozambique. Which illustrates how ethnicity results can reveal insightful ancestral connections even when DNA matches are not (yet) available. This Dominican profile showed one of the highest degree of African descent in my survey of Dominican AncestryDNA results. Also his “Benin/Togo” amount is the highest i have observed for Dominicans. Despite this pronounced genetic connection with Africa he still only has five 100% African DNA matches. This might perhaps be a reflection of how the African ancestors of Dominicans mostly arrived in the 1500’s/1600’s instead of the 1700’s/1800’s. Apparently even for Dominicans with above average African admixture. This section of the Dominican population might perhaps be assumed to have relatively more recent connections to Africa (at times via Haiti) on average. 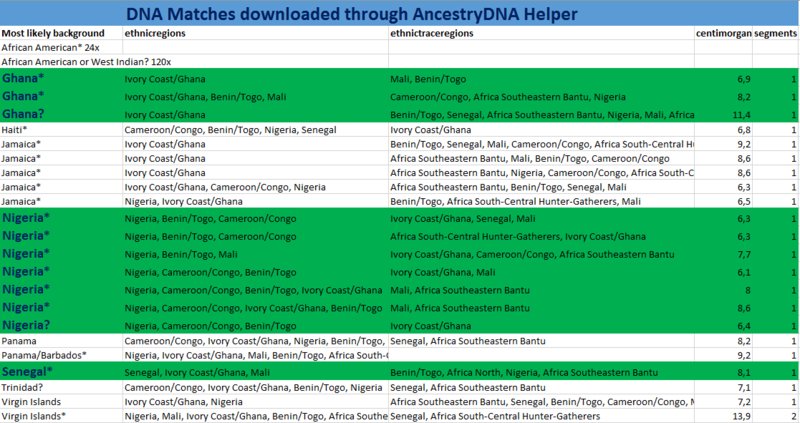 On the other hand this lack of African DNA matches could also simply be due to the fact that there are relatively very few customers from Benin or Togo included in Ancestry’s database. Due to the proximity with Haiti genuine Beninese origins being more likely for Dominicans than for example for African Americans. The one single native African DNA match is most likely of Fula descent and would probably connect with this Dominican’s 6% “Senegal” or also his 2% “Mali” or even 1% “Africa North”, all of these being mere trace regions! Interestingly the shared DNA segment is rather big (9,7 cM), which would suggest a MRCA from the 1700’s rather than the 1500’s when people from Upper Guinea arrived in great numbers in Hispaniola. Then again on other family lines this person could very well still be connected to the earliest settlement period of Santo Domingo. Two of his DNA matches actually happen to show a 100% Native American profile! To be connected therefore with this person’s 5% Native American2. This Haitian profile shows an exceptionally high “Cameroon/Congo” score (62%). Not only the highest such amount within my Haitian survey but in fact also among all Afro-Diasporan results i have seen sofar. Also the socalled “Hunter-Gatherers” amount (in this case most likely indicative of Pygmy origins) is very notable. Such predominant Central African scores are however pretty common for Haitians. Especially for people from the northern part of Haiti where according to slave trade records more than 55% of all captives were shipped from Central Africa (and about 4% from Southeast Africa). The two most likely Central African DNA matches seem to correspond very well therefore with this person’s background. However this person also has an additional “Mali” score of 20%. Which even if secondary is still very considerable. Sofar it doesn’t seem apparent that any of her DNA matches connect her with this part of her ancestry. 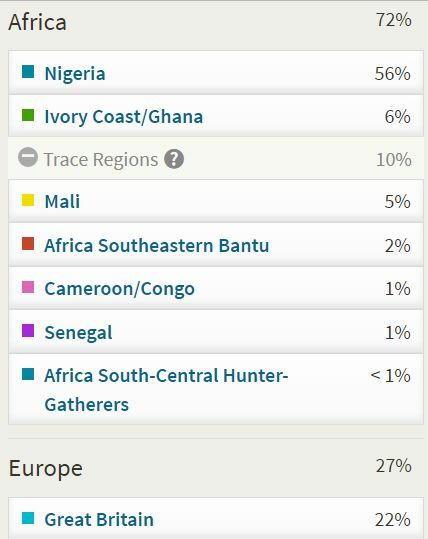 Nonetheless I did find a very intriguing DNA match with an Angolan-born person who also has 1 Cape Verdean grandparent. In fact this Angolan person is also a DNA match for me (undoubtedly by way of her Cape Verdean side). Theoretically the MRCA for the Haitian and this Angolan match might be from several places. Afterall they do not only share the Central African regions of “Cameroon/Congo” and “Southeastern Bantu”. They also have in common the regions “Mali” and “Iberian Peninsula”! Still based on historical plausibility it would seem that the socalled 4% “Iberian” score for the Haitian is French rather than Portuguese. Also i have checked to see if there might be any other Cape Verdean DNA matches for the Haitian, which was not the case. Much more likely then a Central African MRCA which is afterall in line with the Haitian’s overall profile. 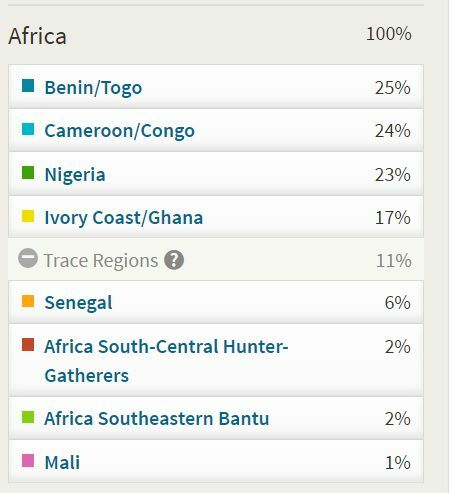 It is noteworthy that despite having the lowest total number of DNA matches in my overview this Haitian profile still is connected already to 19 persons who are 100% African (genetically speaking). This is probably correlating with the relatively high frequency of 100% African scores occurring among Haitians. Intriguingly 2 of her 4 Haitian 100% African DNA matches are in fact her granddaughters (see columns centimorgans & segments)! Even when she herself is not 100% African because of her 5% European admixture. This might seem quite remarkable at first. But in all likelihood it is simply the outcome of random recombination across the generations and genetical “wash out”. I suppose this could also serve as a reminder that Afro-Diasporans who score a “perfect” 100% African on a DNA test might still have some distant non-African ancestry. Even when due to either recombination or thresholds it is no longer detectable. This Jamaican profile is remarkable for several reasons. First of all because of the extraordinary amount of 63% “Ivory Coast/Ghana”. Which is the highest i have observed among 100 Jamaican results sofar and the second-highest among Afro-Diasporans. Actually in my AncestryDNA survey i have found that such predominant (>50%) regional scores (or also the top 2 regions combined) are more common for Jamaicans than for African Americans who tend to be more regionally diverse. 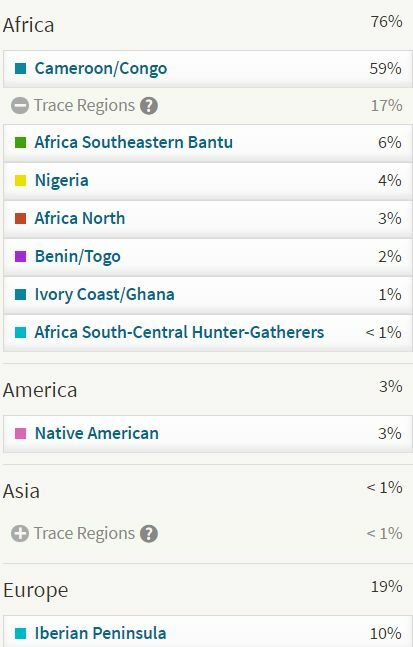 Aside from the African American from Georgia the highest number of 100% African DNA matches i observed was for this Jamaican (58). Probably to be correlated again with her own near 100% African genetic profile. I did however come across atleast 3 DNA matches which appear to have been erroneously reported as being 100% African by Ancestry (see also footnote 1). From these 58 “100% African” DNA matches four are however certified native Africans. Appropriately connecting this Jamaican with her main Ghanaian & secondary Nigerian lineage. There might actually be a third Ghanaian DNA match. 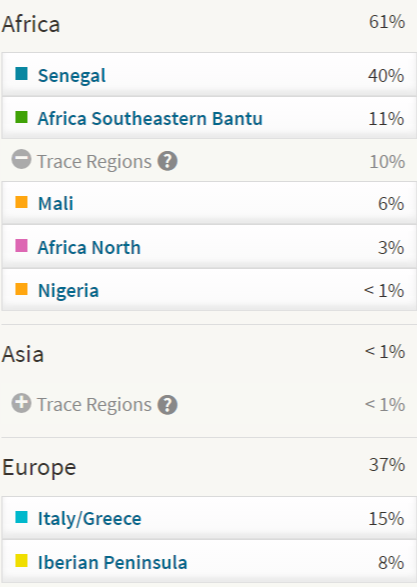 Although i suspect that a Liberian background is more likely (given the Liberian DNA breakdowns i have seen already). Even when it is practically beyond doubt that this Jamaican has a major part of her DNA originating in Ghana. It can still not be ruled out that part of her 63% socalled “Ivory Coast/Ghana” score is to be linked to other countries. Especially Liberian but even some minor Sierra Leonean lineage might still be possible. Such a scenario could be valid for most other Afro-Diasporans as well. However the likelihood is depending on the respective shares in Trans Atlantic Slave trade coming from either Sierra Leone, the Windward Coast (=Liberia & Ivory Coast) or the Gold Coast (=Ghana). Comparing the slave trade records for example for Jamaica and the USA it would seem that the odds of “Ivory Coast/Ghana” denoting genuine Ghanaian origins would be much higher for Jamaicans. Receiving any DNA matches from either Ghana, Ivory Coast, Liberia or Sierra Leone is very insightful indeed but will still not be conclusive for the overall picture. The most mysterious match and perhaps least in alignment is the one who has “Southeastern Bantu” as only main region. I have no certainty about the background of this match. But based on his Portuguese family name this match might possibly be Mozambican or also a South African background could be likely. Both countries would be highly exceptional as ancestral places for Jamaicans. 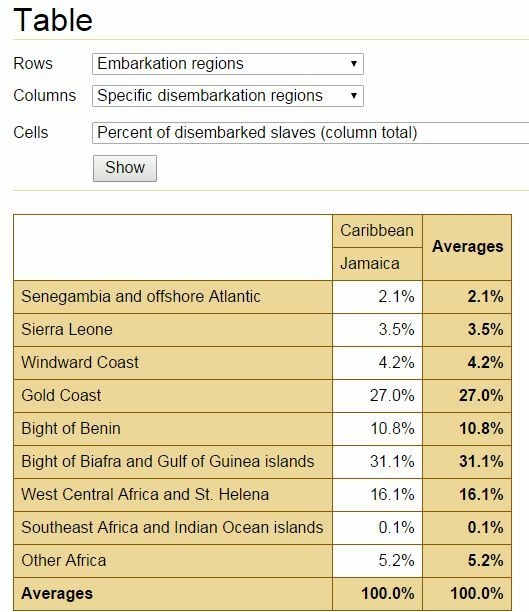 Afterall the share of documented slave trade coming from Southeast Africa into Jamaica is one of the lowest across the Diaspora, only 0,1%! 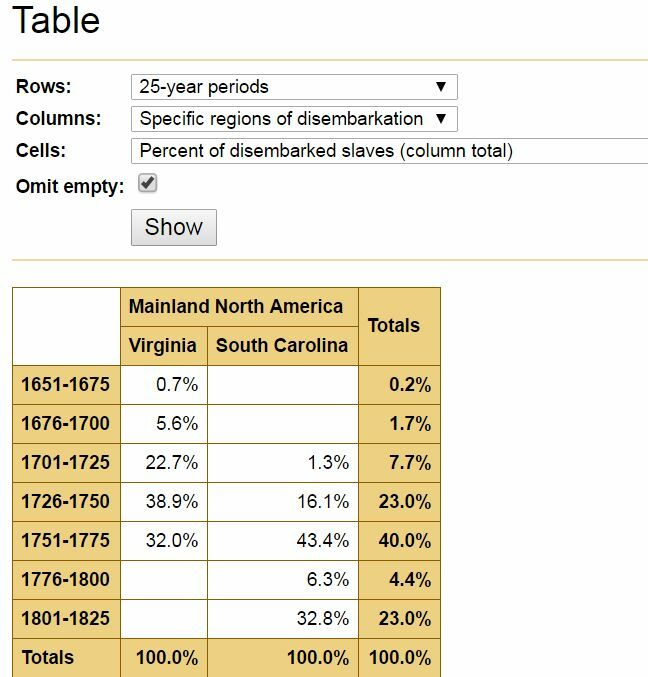 (see this chart taken from the Slave Voyages Database). Eventhough the “Southeastern Bantu” region does appear in this Jamaican’s breakdown (4%) and also for other Jamaicans (3.3% on average in my survey) an Angolan or otherwise Central African scenario would seem most likely. Then again the ethnicity preview for this particular match might also be a glitch on Ancestry’s part or perhaps this match has opted out of full Ethnicity Profile Display (see also footnote 1). Either way the segment size is quite small and already suggestive of IBS or IBP. As a final consideration it is still noteworthy that the Jamaican behind these results has told me that both of her parents are from the St. Thomas parish and her father’s family practised Kumina. Kumina being a Central African derived religion/tradition! This Puerto Rican profile belongs to the sub-group i identified in my Puerto Rican survey as having above average African origins (>35%). These participants formed a minor part of my overall survey. But I found some very interesting regional patterns for this sub-group which contrasted with the other Puerto Ricans in my survey. Most importantly their notably higher group averages for “Nigeria”, “Cameroon/Congo” and “Ivory Coast/Ghana”. Possibly to be correlated with relatively more recent African origins (1700’s/1800’s instead of 1500’s/1600’s). Eventhough the “Ivory Coast/Ghana” amount in this breakdown doesn’t appear to be that prominent it is still one of the highest such scores i have observed for Puerto Ricans (sofar 25% being the highest but admittedly i haven’t yet been able to include all too many Puerto Ricans of predominant African descent). It is striking how already three Ghanaian DNA matches exist to illuminate the 14% “Ivory Coast/Ghana” amount and also 1 Congolese match is very likely connected to his 10% “Cameroon/Congo” score. Which makes for a rather consistent matching pattern. However i could not find any corresponding matches yet for his other main African regions: “Mali” and “Benin/Togo”. Nor for any of his lower confidence regions. It would appear to be quite ironic but could actually be very insightful if this Puerto Rican eventually receives a Nigerian DNA match given that his Nigerian amount is a mere trace of < 1%. Compared with the other nationalities in my overview this Puerto Rican profile received by far the greatest number of DNA matches: 12,411 (249 pages)! This is most likely caused by a high degree of endogamy among Puerto Ricans combined with a high number of Puerto Rican profiles within Ancestry’s customer database. Furthermore it would seem that also other Hispanic nationalities tend to be very “matchy” with Puerto Ricans. Cape Verdeans are also very much a genetically closely inter-related population but number wise they are not in the same league (even when quite numerous already). The total amount of African admixture for this particular Puerto Rican actually is quite similar to the average admixture level of Cape Verdeans as well as Dominicans. We can see that in all 3 cases only a very subdued number (<10) of 100% African DNA matches was found. As also occurred for the African American from Ohio and the Brazilian. Which contrasts with the higher number of such 100% African matches for the African American from Georgia as well as the Haitian and Jamaican. Probably not by coincidence these last three profiles also showed the highest degree of African admixture (>90%). Still overall the African DNA match reporting for the Puerto Rican might be more compatible to those three latter profiles because of similar West/Central African origins from the late 1700’s and early 1800’s and less generational distance to MRCA’s (on average, but take note of the 11,1 cM segmentsize for one of his Ghanaian matches!). If you want your research to be all encompassing you will want to rely on the complementarity of admixture analysis and DNA matches. The truth has many angles. Explore them all! African American man (on the right) meeting his Guinean DNA cousin at the gate of no return on Gorée Island. In this last section i will highlight some inspiring stories of Afro-descendants who were able to reconnect with their African kin through DNA testing. But first I will list an overview (not exhaustive & in no particular order except alphabetical) of some very praiseworthy organizations, individuals, FB groups etc, all of which actively involved in enabling people to connect with their African DNA matches. 1) The number of “100% African” matches for this African American woman from Georgia seems very elevated compared with the other profiles. Still 166 out of a total of 2177 matches represents a share of only about 7% which seems less excessive, given that she is herself also 100% African. Also her personal background adds to plausibility (incl. Geechee/Gullah connections and with state origins being not only Georgia but also Florida). Nonetheless i should mention that i have a strong suspicion either a couple of incomplete ethnicity details or also some glitches may have been included. This suspicion is based on several of the familytrees i was able to consult for her DNA matches. These matches were supposedly 100% African yet still had relatives of clearly European origins only 1 or 2 generations removed. Ironically also one of her DNA matches is described as 100% socalled “Mali”, even when her own “Mali” score is a mere 1%! And according to Ancestry even native Malians rarely score above 50% Mali! This possibility of incorrect ethnicity previews has been confirmed to me by someone else who stated that Ancestry did correct the initial AncestryDNA results for one of his matches after a complaint was made however the profile summary remained as before. Another possible explanation would be that the DNA match in question has opted out of the socalled full “Ethnicity Profile Display”. This would appear to be a default setting and applied to practically all of your DNA matches. But in a few cases it might happen that someone chooses to uncheck this box and then “your DNA matches will only see the portion of your ethnicity estimate that they share in common with you“. (see DNA settings on ancestry.com). 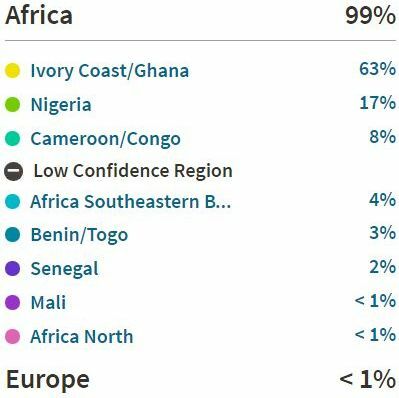 As an additional sidenote this African American woman from Georgia, despite being genetically 100% African, did also receive 4 DNA matches who in turn were reported to be 100% European genetically! Now actually there could be a perfectly logical explanation for this outcome. Afterall it is estimated that due to dilution any genetical inheritance of a single ancestor will be undetectable (dependent on threshold) after about 8-10 generations. I suppose this might intriguingly imply that either the African American woman still has one single white ancestor somewhere down the line, or in reverse her 100% European DNA matches have one single African ancestor from many generations ago. This entry was posted in African Americans, Anglo Caribbean, Brazil, Cape Verde, DNA Matches, DNA Testing, Dominican Republic, Franco Caribbean, Genealogy, Jamaica, Puerto Rico. Bookmark the permalink. Simply put: EXCELLENT! What you’ve done (doing I should say) is so beneficial to researchers connecting or reconnecting Afro-Diasporans to their African roots is phenomenal. This is a huge added value to your already fantastic statistical reports. I would encourage you (which you probably are or thought about) to compile all this work and publish it (eBook). You might as well receive some compensation. I’ll be the first to purchase copies. Thank you so much for your continued readership, encouragement and appreciation! If i should ever publish anything i would insist on giving you the first free copy! Your feedback has been truly meaningful to me right from the beginning! I am really excited about this growing wave of Africans (and their migrant offspring) taking DNA tests. This will open up new horizons for so many people seeking to find more precision and peace of mind about their African origins. I have a feeling this will just be the beginning. African population sampling has been rather stagnant during this decade. But inevitably things will get moving and then we will also finally get some updates of admixture analysis on both Ancestry.com and 23andme. I want to add that there are glitches in AncestryDNA Ethnicity Estimate returns. I have several 100% African matches (African Americans), so I thought. I followed-up with them, and most responded differently. I also observed that I and another relative matched the same person. From my account, all regions of the match were Africa. From this cousin’s account, the same match includes two European cluster areas in the Trace Regions. Indeed! Since publishing this blog post i have again encountered several examples of incomplete “Ethnicity Profile Display”. Just like i did for the African American woman from Georgia as well as the Jamaican profile (see foot note 1). Obviously everyone is free to decide the extent of information they wish to share with their matches. However i would really like to urge ancestry.com to give some kind of notice to determine whether the ethnicity regions on display on your match’s profile page are indeed complete or only showing the regions they have in common with you. As it is right now i find it potentially misleading!